I’ve always suffered with numbness in the hands during an extended ride and have tried to solve the problem with a variety of different gloves, with mixed results. However, a looking 4-hour XC race in November (2013) meant trying a new tact. Suprisingly, the set-up that’s worked best to date has been some simple On-One lock-on grips, but even this was proving ‘achy’ after two hours riding, so that meant a serious look at the Ergon range. 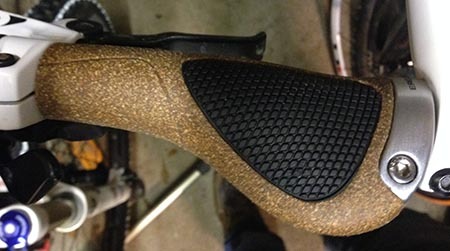 Ergon have been producing their broad, alternative-looking grips for some time now, and they’re probably percieved as being at the ‘touring’ end of the cycle spectrum – so, let me correct this perception. A – I assumed that the cork would give some additional comfort over the moulded versions. B – They look pretty cool, albeit not as racy as the lock-ons (In your humble opinion – Ed). Fitting was easy, they only have a locking ring on the outside end, but that seems to be very secure. I was concerned that putting a broad winged-type grip on a mountain bike would compromise the ability to hang on to the handlebars, but in reality this isn’t an issue and your natural grip (the strong part with the thums and forefingers) wraps firmly round the Ergon grip… no problem there. The first ride out on the Ergon grips was two and a half hours, and that proved to be completely pain-free. I was expecting them to be comfortable, but I was suprised by exactly how comfy they were. Two weeks later I did the first round of four-hour Brass Monkey XC race series and came off the end of that with no noticeable problems with my hands – it was a revelation. If I have any criticism of the grips it would be that I have a habit of riding the fast flat sections with the balls of hands resting on the grips – and in that position I probably felt slightly less secure than on the old lock-on grips, but that’s an issue of my riding style, rather than the grips. Anything with some technical riding up to two hours, stay with standard lock-on grips. Anything else, short non-technical or over two hours, go with the Ergons every time.